John the Baptist gave advance testimony to the coming of the Lord. He had a following of his own although many around him were still grappling with who he was and why was he baptizing if he was not the Christ, nor Elijah, nor the prophet spoken of by Moses. John’s purposeful ministry launch was full of questioning and misunderstanding by many around him. But he was clear on the One who was to be followed. “Behold, the Lamb of God!” he exclaims before two of his disciples as they watch Jesus walk by. The two disciples immediately leave John and they follow Jesus. With no disrespect toward John, they actually heed his call and redirect their own life focus. This is the impact that Jesus had on those around him then as well as today. The gathering and building of his original team of disciples plays out as these drafted men are attracted and compelled to leave their world behind and follow him blindly. While it ultimately cost them their lives, their selected wisdom and discernment at that moment served them well in truth and history. 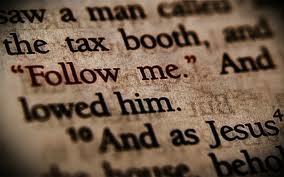 We follow friends, leaders, idols and would-be kings and princes. We can disassociate from even family and close friends and direct our attention and focus on what can ultimately prove fleeting, light and even empty. Our allegiances reflect our own personal wisdom and discernment at crucial junctions in life. Is our judgment sound, wise and large, or frivolous, foolish and small? Jesus and John command full attention toward the One who is the Christ, the one whose sandals John says he’s “not worthy to untie.” John and his disciples knew it and acted accordingly. It reflects their mettle, passion and ultimate path. This is a lesson in heart-devotion, not a call to human charity. At another time when asked which was the greatest commandments, Jesus answered “‘Love the Lord your God with all your heart and with all your soul and with all your mind. This is the first and greatest commandment. And the second is like it: ‘Love your neighbor as yourself. '” The rich young man had a stark choice: follow (love) the One who is the Christ (the Lord God) with all his heart and soul (more than his wealth), or not. He chose poorly, a reflection of a less than fully committed heart. God wants our hearts, not our money. He wants our full commitment, not our inclinations or good intentions. He wants our right devotion, not our good deeds. John the Baptizer understood this, as did early disciples; in fact they died for Christ. That full identity reflects a sold-out, committed life. Certainly whether we recognize it or not, we are who we follow.